The Perfect Weight program! 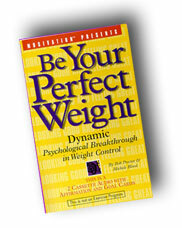 The newest most effective Psychological breakthrough in weight control. YOU CAN become your PERFECT WEIGHT. YES YOU CAN!!!. It all begins in your mind and the image you have had projected into it over the years. Whether you are UNDER WEIGHT or OVER WEIGHT, this program will be the Genie, the Magic Lamp to light up your MARVELOUS mind to achieve YOUR PERFECT WEIGHT.